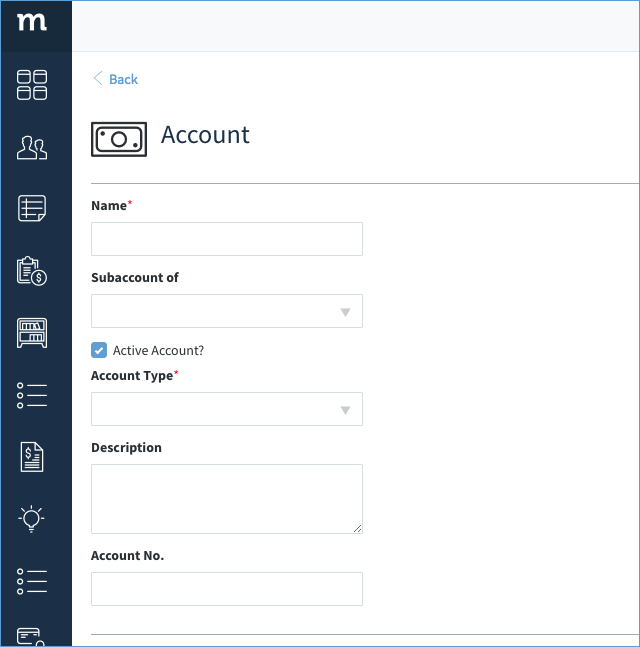 The Accounts App lets you create and modify transactional accounts and sub-accounts that sync with QuickBooks. An account is a way for your company to categorize its money: be it income, expense, equity, asset, or liability. Transactions and items are assigned accounts, which helps your accountant to organize the Chart of Accounts in QuickBooks, keeping track of your day-to-day funds. To create an account in Method, which will sync to QuickBooks, follow the below steps. 1. 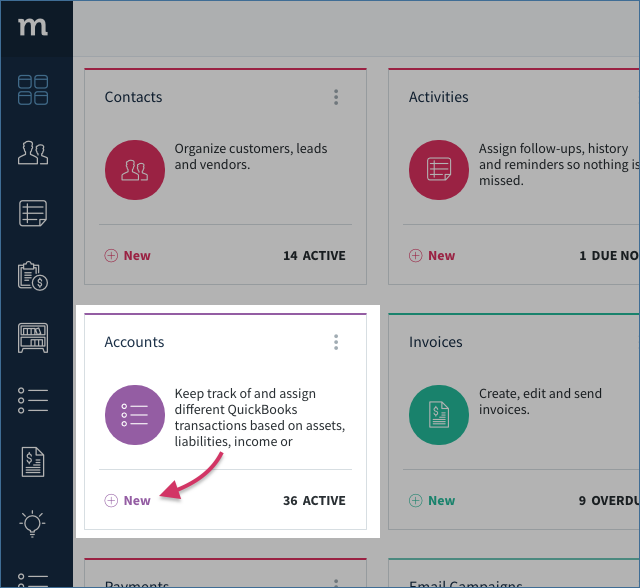 On your Method dashboard, click ⊕ New on your Accounts App, or click ⊕ New Account on your Accounts List screen. 2. This opens the New / Edit Account screen. Fill in the appropriate fields. Name* - Give your new account a unique, and descriptive name. Subaccount of - If applicable, choose a parent account for this account. Sub accounts are typically used to categorize specific types of transactions. For example, if the parent account is "Travel Expenses" a sub account might be "Meals" or "Transportation". This helps your accountant more accurately keep track of funds. Active Account? - If checked, this account is available as an account choice. Account Type - Account types determine whether this account appears on the Balance Sheet or Income Statement in QuickBooks. If this is a sub account, it must be the same type as the parent account. Description - Provide a description for your account. Account No. - The account number appears ahead of the name when synced with QuickBooks, in the chart of accounts, and accounting reports. 8. Cick Save & Back. You are returned to your Accounts List. And you're done! You've successfully created a new account.